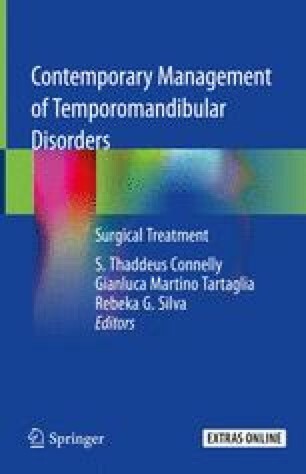 Patients with temporomandibular joint (TMJ) pathology and coexisting dentofacial deformities can be corrected with concomitant TMJ and orthognathic surgery (C-TMJ-OS) in one surgical stage or separated into two surgical stages. The two-stage approach requires the patient to undergo two separate operations (one surgery to correct the TMJ pathology and a second operation to perform the orthognathic surgery) and two general anesthetics significantly lengthening the overall treatment time. Performing C-TMJ-OS in a single operation significantly decreases treatment time, provides better outcomes, but requires careful treatment planning and surgical proficiency in the two surgical areas. There are TMJ pathologies that require total joint prostheses for best results. The application of computer technology for TMJ and orthognathic surgical planning and implementation has significantly improved the accuracy and predictability of treatment outcomes.